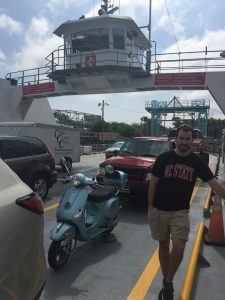 If you haven’t ever taken the Mayport Ferry, also known as the Saint Johns River Ferry, across the St. John’s river from Fort George Island to Mayport — do it — you’re in for a trip! David and I had a couple hours to kill (and we didn’t want to work) so we drove about 30 minutes south from the Blue Heron Inn down A1A to catch this car/passenger ferry. It leaves about every 30 minutes so we didn’t have long to wait once we arrived. I’ll have to admit it was cool watching all the cars and motorcycles loading up for the ten minute ride across the river. 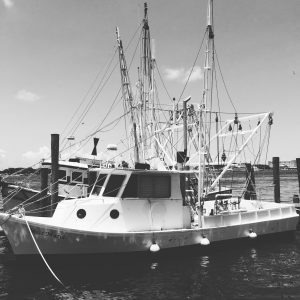 Once we got across we hopped into Singleton’s Seafood Shak for a shrimp burger and delicious fried onion rings and conch fritters. 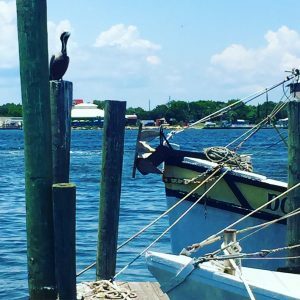 We sat outside on their docks and watched the pelicans do their thing. There is also another cute seafood restaurant before you board the ferry called the Sand Dollar. That’s for next time!